Travelers to Caribbean Central America are often surprised to encounter the mix of West African drumming, spirit possession, and English mumming traditions that comprise the expressive culture of the Garifuna people, a multilingual group of mixed Afro-Amerindian descent who never submitted to slavery. Populating the Atlantic coast of Belize (formerly British Honduras), Guatemala, Honduras and Nicaragua, the Garifuna have survived in a tropical environment whose relative lack of commercially exploitable resources (at least until the advent of mass tourism) has enabled them to preserve their unique African-diaspora culture, language, music, dance and spiritual traditions. The cultural transmission of Garifuna expressive and spiritual traditions entered a long decline at the end of World War Two, as growing numbers emigrated to the United States in search of work. Having apprenticed with late master drummer and drum maker Isabel Flores, singer-songwriter, guitarist, percussionist and painter Pen Cayetano is the leading Garifuna cultural revivalist. Concerned with the cultural disaffection of Garifuna youth, for decades Cayetano has sought to revive the music and dance once commonly performed in coastal Garifuna settlements, thus becoming the most prominent cultural spokesperson of the postwar generation. 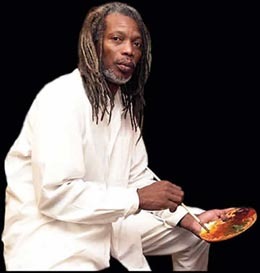 Born in 1954 in southern Belize, in the "Garifuna capital" of Dangriga, Cayetano assembled a group of friends in 1981 to found the Original Turtle Shell Band. 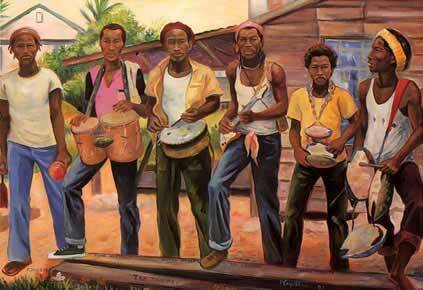 Cayetano's stylistic innovation was to combine time-honored Garifuna song and percussion with rock amplification. The dynamic result came to be known as punta rock, based on a sacred Garifuna rhythm whose percussive verve has captivated Central American musicians and dancers and their expatriate counterparts in major U.S. urban centers where Garifuna are concentrated. Little known outside the culture, Garifuna music, dance and ritual perpetuate the participatory dynamics of African-diaspora music-making, sustaining core West African aesthetic values that encourage a vital interaction between performer and audience. The tradition emphasizes virtuoso artistic display, community participation, ethnic identity expression and messages of cultural survival. Traditional vocal, percussion and dance build on an ensemble of three garaón drums: the improvising lead primera or heart drum, the counter-rhythmic segunda or shadow drum, and the steady bass-line tercera, backing a call-and-response vocal chorus. Other instruments include turtle-shell and bottle percussion, claves, shakers and scrapers with Amerindian origins in South America. Based on that ensemble, Garifuna sacred music invokes the ancestors to visit and advise the living in dramatic communal spirit-possession rituals akin to better-known New World African practices in Cuba (Santería), Haiti (Vodoun) and Brazil (Candomblé). The dugú ceremony, which may last several days, includes healing and spirit-possession songs mostly sung by women, whom Garifuna believe are more attuned to the spirit world. Using the same instruments, Garifuna secular music and dance animate the local expression of carnival-masquerade traditions found from New Orleans to Cuba, Haiti, Jamaica, Trinidad and Rio de Janeiro. Apart from punta, another prominent Garifuna genre is paranda (Spanish for "carousal"), a ballad form that adds acoustic guitar to the garaón ensemble. Paranda can be heard at wakes and in the Christmas Jonkonu custom of serenading house to house in fanciful masquerade, with costumed dancers, the boldest on stilts, soliciting small gifts of food, rum and cash from an appreciative audience. Secular Garifuna music recalls the Nyabinghi drumming of early Rastafari music in Jamaica, with traces of early calypso, Jamaican mento and Belize's own picaresque "boom-and-chime" music. Reproducing the pattern of emigration so common among Garifuna, since 1990 Cayetano himself has lived with his family in Germany, where he maintains a studio and a busy schedule of international art exhibitions and performances with his family band, the Cayetanos. He also travels frequently to Belize and the United States to reunite and perform with fellow Garifuna musicians. The three recordings reviewed here span the period 1980-2001, representing an important addition to the scattered recordings that make it is possible to trace the evolution of secular Garifuna music from a local tradition to an increasingly transnational blend of stylistic influences. 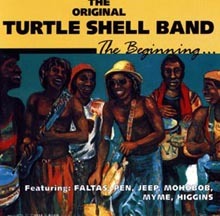 The Original Turtle Shell Band (Turtle Shell Music) was recorded in a Belize City radio studio between 1980 and 1982, just as Belize gained its independence from Great Britain. Digitally remastered in Germany, the recording retains the raw quality of live low-tech, projecting the raucous vitality of an emergent music. After jamming at Cayetano's art studio and perfecting their chops at what they called "roadblocks" on the streets of Dangriga, the band took a bus to Belize City and set up in a park to play. When a tropical cloudburst cut short their enthusiastically received impromptu performance, a passing technician invited them to the Belize Radio One studios, which sessions fortuitously captured the group in its genesis. Perhaps more accessible (at least in terms of recording quality) to the uninitiated listener is The Best of Punta Rock (Turtle Shell Music), a collection of songs laid down between 1982 and 2001. Don't be misled by the title: the only thing "rock" about it is the occasional idiosyncratic use of amplification, and an aesthetic sensibility that stretches intuitively to the West African roots that inform so much New World popular music. The Best documents the ongoing collaboration of Pen Cayetano (vocals, flute, acoustic guitar, bass, turtle shells, Garifuna drums, percussion) with fellow Turtle Shell Band founder Mohobub Flores (vocals, acoustic guitar, turtle shells, Garifuna drums, percussion), who pursues his own solo career as well. The duo comprised the creative force behind the original band, which carried the music of Belize to neighboring Mexico, Guatemala, the Caribbean and the United States (where they first performed at the 1983 New Orleans Jazz Festival). Flores' "To My Heritage" is a freewheeling, infectious minor-key paranda-like collage, quoting the "Marlboro Man" theme (if my addled pop-culture memory serves) and referencing the "sock-it-to-me" soul of the late 1960s, with some especially resonant turtle-shell percussion. Cayetano's "Devil Galfriend" is a sly, rollicking send-up to the woman who "break up the whole place... I say I love it." His "Soufrière" begins as an all-percussion call-and-response Garifuna chant whose mounting vocal tension eases seamlessly into a stirring paranda, "Hagaya Garinagú." Completely unexpected, a sweet change of pace is Flores' perfectly understated "Turtle Shell Band Blues," indeed a blues with an impromptu feel, some off-the-cuff verbal exchanges, and understated guitar and bass work. "Spirit of St. Vincent" is a percussive anthem to Garifuna origins in the eastern Caribbean island of that name, more in the style of the sacred Garifuna dugú invocation to the ancestors. Most popularly accessible and manifestly dance-oriented is The Cayetanos (2000 - Turtle Shell Music), with Pen (vocals, rhythm guitar, Garifuna drums, turtle shells), wife Ingrid (percussion, backing vocals), and their children Mali (keyboards, vocals), Beni (bass, backing vocals), and Ibo (drums, backing vocals). All but one song are Cayetano originals, the exception a meditative, percussion-only sacred dugú chant, "Wamalíha," with Cayetano's reverb vocals, the most unusual track of an otherwise amplified repertoire. Also striking is "Electric Jonkonu," with more echo-chamber vocals, here against vintage freak-out fuzz-tone Hendrix guitar (by guest Bruno Bertram), anchored by a driving Garifuna percussive figure. "It's Over" is a reggae-like salute to the panoply of African nations; also reggae-inspired is "You Absorbed My Thoughts." 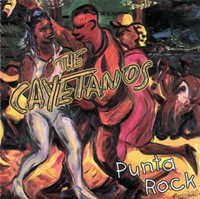 "Bani Leh," "Children Dance," "Workin' Man" and "Huya Balice" are good examples of Cayetano's punta rock style, now widely assimilated by bands up and down the Caribbean coast of Central America - in a frenetic dance rhythm that will confuse salsa fans conditioned to the 3-2 clave of Afro-Cuban music. "Time to Share" is a languid 3/4 ballad owing inspiration more to R&B than Garifuna roots, while "Do the Punta Rock" energetically channels some fluid Allman-like amplified guitar (again by Berman) through an archetypal punta framework. You can discover more about Pen Cayetano's music and art at his web site.